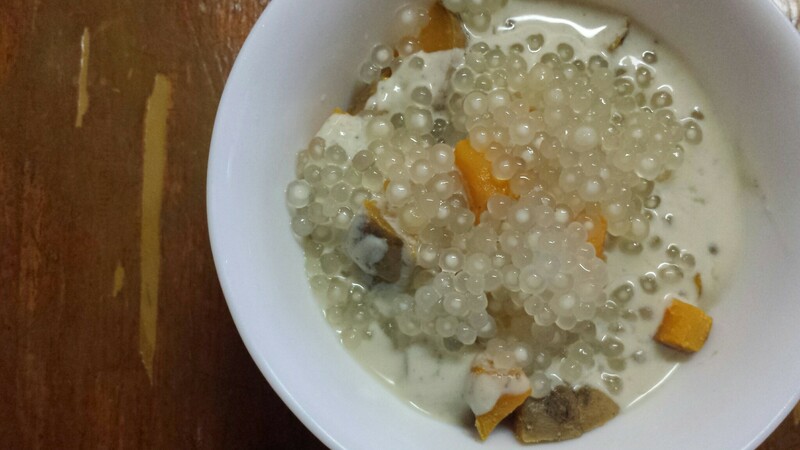 I grew up eating tapioca pearls or sago, which is not a basic generalization of the whole readership of this blog. We had it in our taho, a soy based drink/dessert/breakfst. We also had it in our sweet coconut dessert made with root crops, sticky rice balls, and fruits. So its very common place. But eating tapioca as a pudding wasn’t really the norm for me. I have watched it online, and have seen it in instant box forms. I have. It have had it dessert which is more soupy and not really pudding like. I have made tapioca pudding before, but used milk/cream/lemon. I decided to use coconut milk this time, for a richer and more local flavor. I first bought some sago and cooked it as directed in the package. I then kept it in the fridge. I cooked some canned (I didn’t have fresh) coconut milk, about 1/2 cup, with about 2 tablespoons of palm sugar and some nutmeg. I let this cook and thicken, and this was also cooled in the fridge. No need for an egg as a thickener actually, since the coconut milk really thickens quite a bit, especially with the addition of sugar.